1Place rinsed lentil into a medium stockpot. Add 2 cups water and bring to heat. When starts to boil remove from heat, open slightly the cover and let the hot water out. Add 2 cups of cold water, bring to boil and repeat. This is how we clean dry beans before we start cooking them. 2After cleaning the lentils a second time, add cold water up to an inch above lentil. When it starts to simmer, add onion, tomato, garlic, herbs and the olive oil. Bring to a boil; reduce heat, cover and simmer until the beans are soft. Remove the water and add 2-tablespoons olive oil and salt to taste. 3Peel the acorn squash, remove the seeds and cut it into 1” thick crescents. 4Add the cipollini onions to boiling water. Remove them after 30 sec. The outside dry peel will be easily removed. 5Trim the bottom of the fennel bulb, cut the stalks and halved lengthwise into ¼” pieces. 6Put all vegetables in a large plastic zip bag, add already mixed olive oil with salt and black paper and turn to coat well. Marinate for 15 min at room temperature. 7Line a piece of baking paper on the oven rack and preheat oven to 350 degrees. 8Place the vegetables flat, leaving 1” distance between them. Bake them for 20 min at 350F. 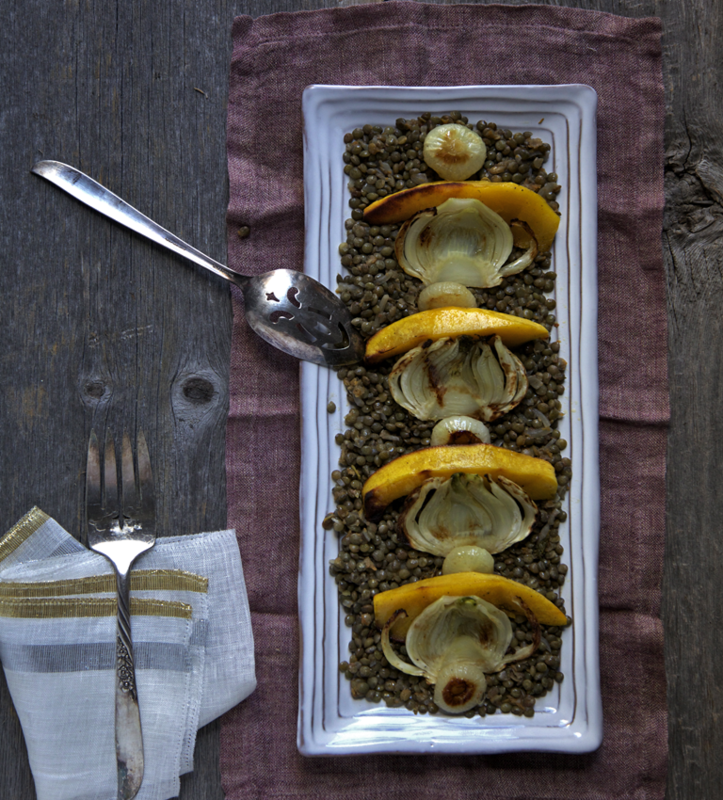 9Arrange the lentil and the baked vegetable in a plate and just before serving drizzle over aged balsamic vinegar.